Most observers presumably see this and go "Sh*t! THIS is gonna blow! ", and in many ways the development of the property market over the last three decades is a topic worthy of that kind of attention. It is also surprisingly unique in historical terms. Really, rising real housing prices are an anomaly that we've only really seen these last three-four decades. But people are short-sighted, great at forgetting or perhaps have more important things to do than study the economic history of the cities they live in – or even scrutinise their data a bit deeper. 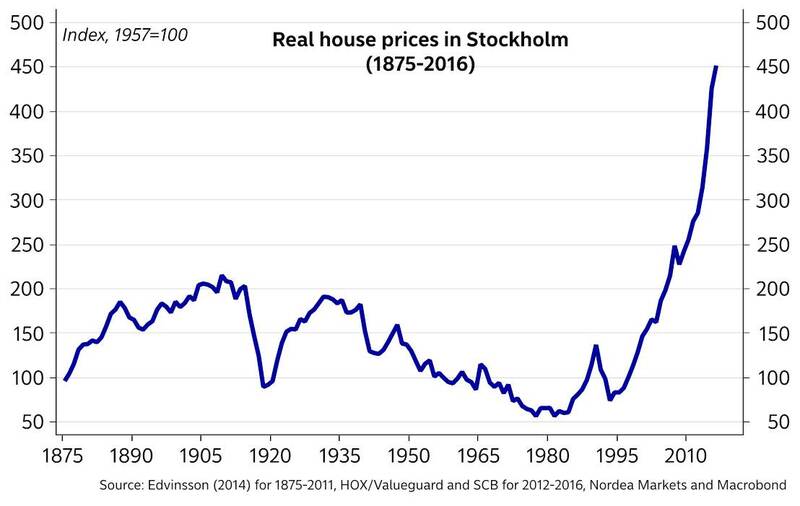 In many of the world’s largest cities and most attractive locations (London, Sydney, San Francisco, Paris, Stockholm etc) the story is the same: seriously rapid increases in real housing prices. 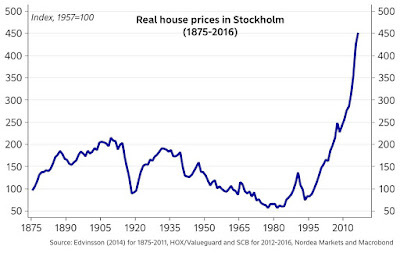 Enough to convince people that “housing prices always increase”, and other nonsense statements such as “housing is a safe investment” or praises of how important home-ownership is for cohesive societies and thriving communities. No, housing is consumption, and has always been consumption. Whatever else comes with it sociologically or emotionally is beyond my expertise. Though I'll happily comment on the financial *bubble factor* involved here. Having said that, let me explain in a very simple way why this graph isn’t even half as intimidating as it seems. 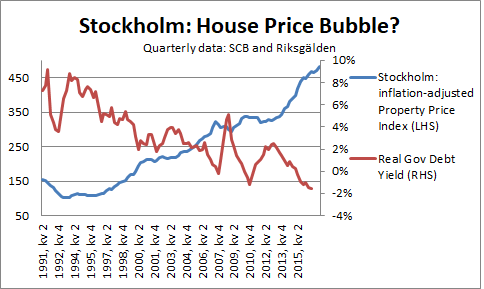 Indeed, most serious economists agree that the Stockholm property market is not a bubble, using arguments about urbanising, migration, income growth etc. (or supply factors of government regulations and zoning laws! ), that convincingly explain why housing prices have risen so quickly. To this they generally add the greatest experiment of our times: our weirdo monetary regimes. Quickly running the numbers through statistical softwares gives me a statistically significant R2 of -0.78, meaning that we statistically can explain 78% of the changes in housing prices by the falling real interest rate alone. Of course, this is very quick-and-dirty calculation and some additional regressors and controls should be added. In a nutshell, the mechanism here is that as funding costs for assets fall, more people want to and can afford to pay higher prices – which, in a market seriously restricted by supply and construction times, means that market prices will shoot up. While the exact magnitude is debatable, the general story is clear and quite uncontroversial among those looking at property markets: it's very easy to explain the high property prices as a result of real interest rates –this is not bubble territory. Now, let me finish with an important but boring disclaimer. The global fall of real interest rates over the last decades largely explains the development of housing prices – meaning: not a bubble – but that doesn’t mean prices could never fall. They can. When (or if*, which I still find rather unlikely) real interest rates again bounce up, housing prices will fall – but that doesn’t mean the bubble has finally popped. When and if prices fall, you’ll have pundits like ZeroHedge running victory laps and crying “WE TOLD YOU SO!” – except that every introductory finance class did so too; asset prices are intrinsically linked to real interest rates; when they increase prices should fall, all else equal. Lastly, stop crying ‘bubble’ every time some relative price changes faster than you’d like. Among the very virtues of markets is that such prices can change; we even want them to change in order to incorporate and synchronise various unknowable preferences and desires of 7bn+ people. But rapidly-changing relative prices are not therefore bubbles; if the production lines of strawberries or Brazilian coffee or Florida oranges or California almonds face serious shortfalls (to name some recent examples) we’d expect prices of those goods to rise rapidly. Nobody can, let alone should, therefore conclude that there’s “an almond bubble” or a “coffee bubble”. Same thing goes with housing prices, but on a larger scale. Stop seeing bubbles everywhere, and start using that economic sense of yours. Or, as one of my lecturers at University of Sydney used to say: It's the interest rate, stupid. I am very much pleased with the contents you have mentioned. best school in mayur vihar I wanted to thank you for this great article.